There have been several significant advancements in dentistry that the dental industry would consider to be game changers. Over a decade ago, Zirconia was introduced to the dental world as a ceramic material intended to be utilized for the fabrication of Zirconia crowns and Prettau Zirconia bridges. Zirconia (not to be confused with zircon), is a white crystalline oxide of zirconium. It is a silicate mineral, which is found primarily in Australia and Brazil. 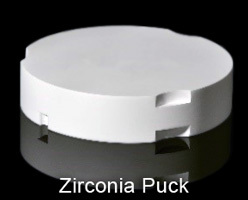 Zirconia crystals are compressed into a block, or puck, which has a chalk-like consistency. In this “greenstick” form, Zirconia can be carved and milled into any shape desired. In order to create a structure strong enough to withstand the forces of chewing, the greenstick Zirconia is sintered or baked in a furnace until it transforms into its hardened form. Although Zirconia in its raw form is pure white, it is possible to stain it before sintering to achieve a more tooth-like appearance. Pink porcelains mimic the appearance of gum tissue. To make the smile look completely natural, other types of porcelain are baked over the surface of Zirconia. This can be done since it doesn't have to be layered over metal. While this layering adds beauty, it also increases the chance that the surface may chip over time. 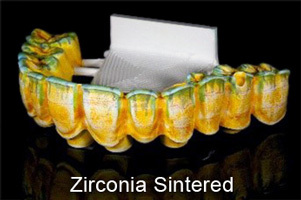 Layering also dramatically increases the cost of the restoration so you should be mindful of these considerations if considering Zirconia as your choice of material. Zirconia crowns are an excellent solution for patients that put excessive forces on their teeth from grinding and clenching, and therefore risk breakage. 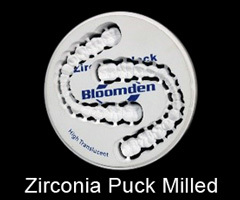 The strength and durability of Zirconia is unmatched in this application and is even higher than most dental metals. With this, Zirconia can also be used for Full Arch implant restorations with great success as a solution for those dental patients that grind teeth or even clench teeth while sleeping. Amanda was in a devastating school bus accident, which resulted in facial trauma, including the loss, and damage of a number of her upper front teeth. Dental implants were used to support a Zirconia bridge that replaces five teeth. As a result of the accident, not only did Amanda lose her front teeth, but she also had damage to her gum line.